The success of Jamaican Poets has helped them to secure their place as positive mentors when they choose to be. Poetry B.L.O.C has been one of a select group of entertainers at the forefront for years, not just with their Literature and style, but also with philanthropy. 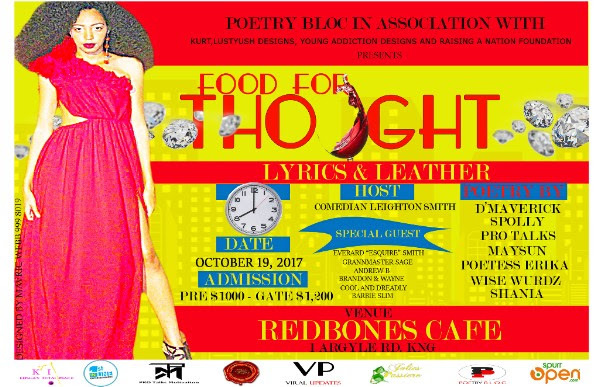 Poetry B.L.O.C has adopted the Sunbeam Boys Homes via Raising A Nation Foundation and has committed to donating 50% of Food for Thought proceedings to Raising A Nation Foundation to assist with providing well-needed provisions. Poetry B.L.O.C will also set up donation boxes for canned food donations from the patrons. Also woefully inadequate is the number of beds and clothes for the children at the home. Poetry BLOC leader Webb will continue to extend the reach of love with his non-stop aid for the unfortunate and homeless. Persons Contributing via talent to the cause, will include the humanitarian works of “Poetry B.L.O.C” ( D’maverick, Ash, Shania, Andrew B, Wayne, Brandon, Kadines Johnson and Everard “Esquire” Smith), the authors of the Amazon best seller The Art of Poetry, Pieces of me and Birth and the winners of Redbones Cafe coveted Poetry Awards; “Oshane Panton”, the founder of PRO Talks Motivation, “Poetess Erika”, the author with a big heart and the writer of over three successful collections. “Spolly”, a renowned underground roots/dub/Reggae king with a heap of surprises, “Wise Wurdz”, “Maysun” the St. Andrew’s High School Literary Genius; “GrannMaster Sage” whose performance can simply be called poetry in motion and “Cool and Dreadly”.